On July 12, 2016, View Park was listed on the National Register of Historic Places. Located near the stretch of La Brea Avenue to Crenshaw Boulevard in unincorporated Los Angeles County, View Park is the largest Federal Historic District in the country based on African American history, and one of the largest National Register districts in California in terms of property owners. The National Register designation culminates an extraordinary journey from View Park's origins in the 1920s, when the neighborhood's developer intended its architecturally distinctive homes, with their sweeping views of Downtown L.A., to be for sale to white homeowners only. According to the 1930 Census, View Park had only one Japanese and two black residents - all three were servants. A landmark U.S. Supreme Court decision in 1948 ruled that restrictive real estate covenants were unconstitutional. Prominent members of the African American community - business owners, doctors, lawyers, entertainers, athletes and civil rights activists, began moving into View Park in the 1950s. Lusignan added, “Often facing intimidation and violence, View Park's new African American homeowners broke down significant barriers and paved the way for the creation of a vibrant integrated neighborhood that would earn it the nickname ‘the black Beverly Hills.’” Legendary View Park residents include Ray Charles (at 4863 Southridge Ave.) and Ike and Tina Turner. Current View Park residents, Andre Gaines and Ben Kahle, co-founded the View Park Conservancy in 2014. The nonprofit neighborhood organization was instrumental in View Park being nominated for listing on the National Register of Historic Places in 2015. 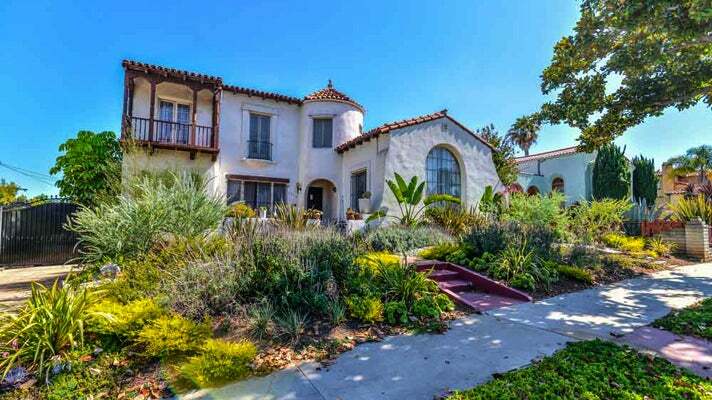 According to the Doumakes House website, pre-World War II houses in View Park were designed in Period Revival styles, such as Spanish Colonial Revival, American Colonial Revival, Monterey Revival, Mediterranean Revival, and French Revival. The site also notes that Postwar residences are predominantly one iteration or another of the Ranch style, with a small number of residences in other styles, including Storybook, Streamline Moderne, and International Style. Today, View Park is the epitome of multicultural Los Angeles - a mix of long time residents, new families, and historic architecture. The community gathers regularly for summer jazz concerts and movie nights at Monteith Park. View Park is also a renowned destination for its summertime home garden tours and historic home tours.